On 27 February I went to a fascinating debate, “Has Britain Got Sport Upside Down?”, hosted by Pro Bono Economics, (a charity established in 2009 by Bank of England Chief Economist Andy Haldane and Tomorrow’s People CEO Martin Brookes) at the Royal Institution, sponsored by Nomura and Weil. The 2012 London Olympics was a tremendous success for the UK, in terms of its performance both in hosting the Games successfully and in the events themselves. The 2016 Rio Olympics saw a record haul of 130 medals, with heroes such as Adam Peaty restoring national pride and apparently inspiring a nation to take up sport themselves. So, it seems a no brainer for UK Sport to invest £345m to win more medals – to take us on “the journey to the Tokyo 2020 Olympics and beyond”. Not so fast. This debate provided a range of viewpoints – from Simon, Tanni, Mark Gregory (EY UK & Ireland Chief Economist who has quantified the economic and social impact of sport), and Will Watt (founder of Jump and an expert in policy evaluation) – on whether UK Sport should instead invest its limited funds on grass-roots sport. I attempt to summarise the main points here; these views are the panellists’, rather than my own, and not shared by every panelist. To inform the debate, YouGov conducted a survey, which provides some of the data here. 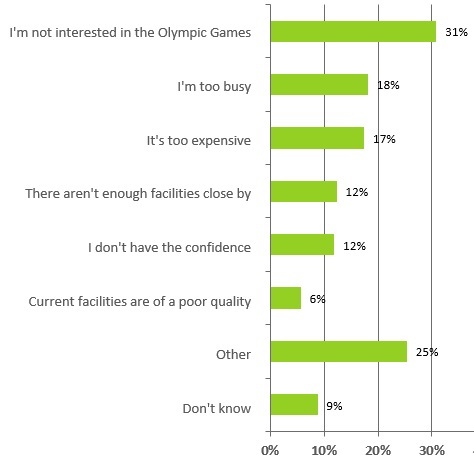 Does the Olympics Inspire Participation? Kids have posters of their sporting heroes on their walls, and dream of becoming the next Wayne Rooney or Andy Murray. Olympic stories are arguably even more inspiring, with many of them having to juggle training with a job or studies. So, it seems obvious that Olympic success should inspire Britons to take up sport. So, the public would rather us divert our limited funds to investing in grass-roots sport, rather than chasing gold medals. Uncannily, this echoes Prime Minister May’s industrial strategy to make business work for “all, not just the privileged few” and calls to focus on the “99%” rather than the “1%”. Gold medals can inspire, but without the opportunity to participate, even the inspired may not take up sport – which may be why only 7% actually do so. In the UK, you ask “which football team do you support?” In Holland, you ask “which football team do you play for?” There’s a massive amateur league structure for both genders. It doesn’t matter if you play for the 7th team – what’s most important is that you’re playing. Iceland beating England in Euro 2016 was a massive shock. But, it’s perhaps not too shocking when you consider the countries’ different approaches to grass-roots sport. The UK sold off school playing fields to a large scale during the Thatcher/Major years. In contrast, in the 1990s, Iceland invested in all-weather pitches. They also had an integrated strategy across all sports. For example, many of their goals and goal attempts came from long throws, which in turn resulted from their investment in handball. There is widespread agreement that the UK should invest substantially in the National Health Service. But, sports is the National Preventative Health Service. The discipline of training for a competition instills discipline into work and study habits. Sporting participation requires focus, determination and quick thinking, firing synapses in the brain. If a child learns to catch a ball at age 2, their Maths and English end up being better. (Note, this is only a correlation, not a causal statement). We should think open-mindedly about what counts as sport. Skateboarding has negative connotations, but it will be an Olympic sport in 2020, and teaches risk-taking. Physical activity among children falls over the summer, despite the weather being conducive to more activity, which one panellist called a “national disgrace”. This is because children have limited opportunities or encouragement to participate outside school. It’s companies’ responsibility to encourage employees to participate, e.g. 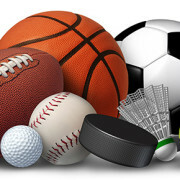 through being intentional about promoting company sports teams, physical activity interest groups, and gyms. We give PE teachers far less respect than Maths teachers. Maths is seen as a serious subject and an investment in a child’s future, but sports are just as much an investment. It’s a no-brainer that a Maths teacher needs a Maths degree, but we invest far less in training PE teachers. In some schools, the PE teachers primarily focus on other subjects and just teach PE on the side. (This section contains my own views). What can economic principles teach us about the optimal funding strategy? They highlight the problems with non-linear schemes, where there’s a sudden jump above a particular threshold. For example, a CEO incentive scheme that pays out if earnings per share exceed £1 provides little incentive to increase earnings from 50p to 99p, but large incentives to increase earnings from 99p to £1, even though the former is a bigger improvement. Similarly, a strategy to maximise Olympic medals provides little return to Team GB finishing 4th in a sport in which they never even qualified for the finals previously, but a substantial return to converting 4th place finishes into a medal. While there’s clearly some direct benefit of medals (national pride and inspiration), most of the benefit is indirect. Olympic finishes are a by-product of general investment in sport, rather than the goal in itself. When there is active grass-roots sport, this feeds through into developing future Olympians – just like purposeful companies do not chase profit directly, but become profitable as a by-product of being purposeful. So, moving from non-finalists to a 4th place position would likely be an outcome of significant increases in general participation – with substantial social benefit – but not be rewarded in medal tables. And, the law of diminishing returns suggests that the investment required to move up from 4th to 3rd is likely substantial, compared to moving up from 10th to 4th. Back to CEOs, an earnings per share target may cause CEOs to ignore other dimensions – e.g. cut R&D to boost earnings. Similarly, a strategy to maximise the number of medals may cause sporting authorities to ignore certain sports simply because the UK has little chance of winning a medal – including mass participation sports such as basketball, which require very little equipment to play. If the ultimate goal is mass participation (and Olympic inspiration is one of many ways to achieve this), shouldn’t the UK invest more in basketball rather than rowing (where participation require a nearby river, the ability to pay for expensive boats, and a job/lifestyle that allows early-morning training)? (Note: I’m terrible at basketball, but have rowed ever since university and love the sport, so any personal bias should be to the latter). The idea of redirecting funding to grassroots sport and away from Olympic medals was not shared by all panellists. Some emphasise the substantial pride that results from Olympic success. This spills over into the inspiration to take up far more than just sport. For example, the stories of how a gold medallist worked hard training in their sport may inspire people to work hard and train in a non-sporting context. Separately, in a 2016 marked by a divisive Brexit campaign, the success in Rio helped unite the country again. Thus, many panelists argued that it should not be an “either-or” strategy. We should invest in the Olympics to generate the inspiration, but also in grass roots to allow the public to act on this inspiration. A skeptical panelist said “nice idea in theory, but in practice, there’s not the money to fund both.” But, we can think of innovative funding strategies. For example, Premier League footballers pay £891m in income tax. We could earmark a small percentage of that to invest in grass-roots football. Perhaps one of the best ways to invest is to help the many volunteers who help encourage sports participation for free. For example, Happy Bootcamps runs bootcamps all across the UK, and in 7 other countries, which provide free high-intensity interval training sessions (that fitness companies would charge £15-30 for). All coaches in all locations (including the founder, a former professional rugby player whose goal is to get 1m people active within 5 years) work for free, yet there are barriers to even voluntary activity. For example, to run a session in London’s Royal Parks requires buying a permit, and developing a website to advertise these sessions is also costly. Giving these permits for free, or the government supporting (either financially, or through its own advertising) voluntary activities could potentially give a substantial return for little investment.